In Windows Vista, parents who want to manage and monitor their children online and offline activities will have easy-to-use and intuitive protection tool called Parental Controls that can be used to ensure family safety and protect the children safe and secure. Previously, controlling and monitoring kids’ Internet browsing, surfing, chatting or gaming activities has been a difficult task as operating system doesn’t have built-in strong parental controls utility, causing parents to use a combination of managing user accounts, third party tools and applications to limit and manage their children’s computer privileges. 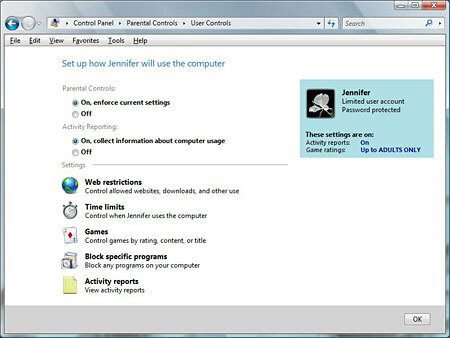 Parental Controls in Windows Vista can be used to manage or control how a minor uses computer by setting limits on user account to restrict on an account’s access to various web pages, limit the time that the kids spend online, or control which games and programs the kids can run. 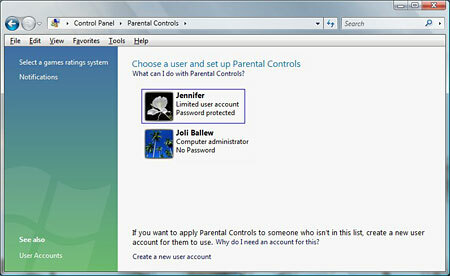 To access Parental Controls, click on Start button and then go to Control Panel. Inside Control Panel, just double click on Parental Controls. Web Restrictions or Web Filters: Control which web sites or web pages your child can or cannot access and what they’re allowed to download, regardless of what web browsers such as Firefox, Internet Explorer, Opera and so on that they used. Time Limits: Control what days and times your child can use the computer. If they try to log on during the restricted period, logon will be denied, and if they’re currently logged on, they’ll be log off. Games: Specify and control which games your child can play by setting rules based on rating, content, or title. Block Specific Programs Usage: Block access to installed programs on the computer that the kids not allowed to run or execute. Activity Reports: Display activity reports that include information about what websites your children visit, how long they’re online, how many e-mail messages they get, and information about who they are exchanging messages with, and other reports.